Karyn loves everyday objects to be beautiful. She believes that if you have to look at something all the time then it should make you happy! Karyn likes both the simplicity of Scandinavian design and the intricate patterns of Indian and Islamic art. Her work is a reflection of these two very different styles. 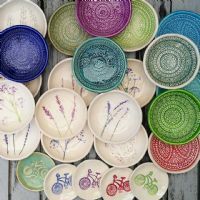 Whilst her children are in school, she creates on her kitchen table and fires her work in a small kiln in her shed in the beautiful seaside town of Greystones.